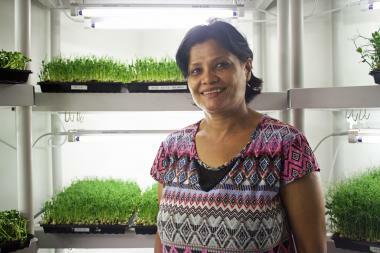 Bidya Rimal of Gracious Greens in front of the family's plants. WOODSIDE — The Rimal family business is growing — literally. The Woodside residents are the proprietors of Gracious Greens, growing microgreens — including pea shoots, radishes and sunflower greens — out of their home off Roosevelt Avenue and selling them at local farmers markets. They started the business about six months ago and began selling their crops this summer at the GrowNYC greenmarket at Socrates Sculpture Park in Astoria on Saturdays, as well as the Marcy Plaza farmers market in Bed-Stuy on Wednesdays. "The response has been great," said co-funder Bivit Rimal, who started the company with his brother Bishwat, mother Bidya and father Kamal. "I'd always wanted to do a family business." The Rimals grow their greens in a spare room inside the family's house, where shelves are filled with trays of seedlings planted in soil made from coconut husks and set under fluorescent lights that mimic the sun. Because microgreens are the younger version of vegetables, they're typically harvested just a week to 14 days after they're planted — which, according to Rimal, lends them more nutrients than when they're fully grown. "They're at that stage basically where they’ve got all the nutrients stored up to be able to grow their second, third and fourth set of leaves," he said of the mini-produce. Each week, he and his brother bring their trays straight to the farmers market, where they cut them right off their roots for each order. "They're harvested the same day," he said. "Local food production — people appreciate that aspect, too. It's kind of nice to let people know, 'Hey, you're eating something that we grew down the block or in another borough.'" Under New York State law, produce sold at farmers markets is not subject to the same Department of Agriculture and Markets regulations as produce sold in grocery stores. The Rimals' booth at the market also features recipes for the greens, including how to incorporate them into salads, smoothies or other dishes. Prices start at $4 for an eighth of a pound of radish greens, or customers can buy a whole tray of the veggies for $35. The family is looking to expand its business to other farmers markets around the city, as well as to local restaurants, Rimal said. They're also testing out growing cilantro microgreens, and plan to try other kinds of vegetables in the future. "If we can figure it out and we can grow it in that room, we'll do it," he said. "We'll try everything."